Find and upload new accounts and prospects directly to Outreach. Find, connect with, and sell to your ideal target accounts. Sales teams need to be able to dovetail their data research efforts with their communication workflows in a seamless way. 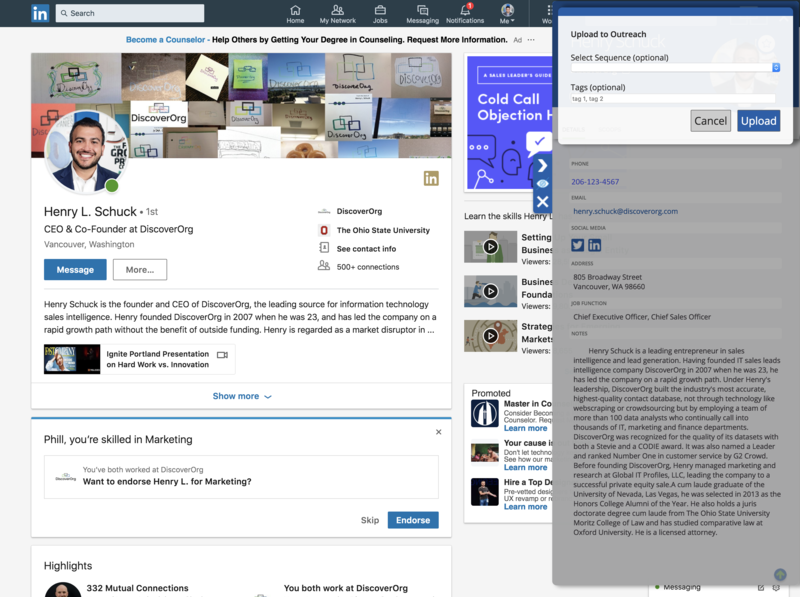 DiscoverOrg integrates into Outreach to allow users to push records into Outreach and add contacts directly into a sequence. With automatic data cleansing and maintenance, users can spend less time hunting, exporting, and importing, and more time prospecting! Detailed search makes it easy for users to find and upload prospects and accounts directly to Outreach sequences, individually or in bulk. Company and prospect intelligence can be pushed directly to Outreach from LinkedIn or corporate websites, complete with direct dial phone number and verified email. Increase conversion and reduce bounced emails with the industry’s highest rate of direct-dial phone numbers and verified email addresses. Rich contextual insights delivered through org charts, scoops, tech stacks and real-time intent data. Each night DiscoverOrg scans Outreach for new prospects, links them to a DiscoverOrg record, and enriches them with human-verified contact information. Linked records are scanned and cleaned weekly to prevent data decay and maintain data integrity. Bounced emails and departed employees are flagged.